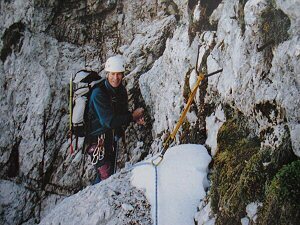 When the valey was deep in the fall and mountains in real winter conditions and I was already thinking about skiing, my guest Miran called me wishing to go climbing Kugy's route in Jof di Montasio. 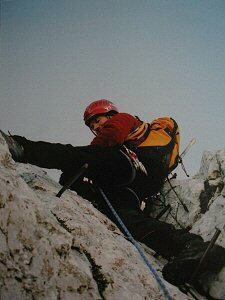 The route goes steeply on the north wall of the mountain. 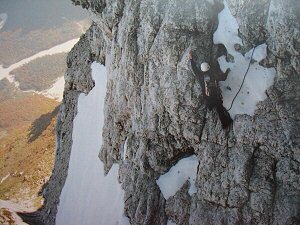 Partly it is free climbing (III+) and partly it is still secured by almost a 100 year old bolts. We ran into real winter conditions. Temperature around -3 degrees Celsius, upper 200 m were covered with thick snow. 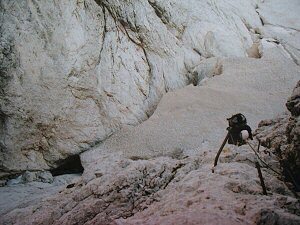 Thus this tour grew up to a serious climbing with bad protection. However Miran has done the tour with exellence.